Can’t seem to fight the urge to pick your face, even though you know you’re not supposed to? You’re not alone! Most of us can’t resist squeezing annoying zits that always pop up right before a special event—and there are some who even gain satisfaction from popping blemishes, on themselves or any willing volunteer. Of this pimple popping fascination, a new online video trend was born. The removal of blackheads, cysts, ingrown hairs, and more have attracted millions of views of YouTube, with “popaholics” tuning in to watch both expertly filmed medical extractions and at-home squeezing alike. But while your pimple-popping YouTube habits are harmless (even if your SO thinks it’s gross), squeezing your spots IRL isn’t a great idea. 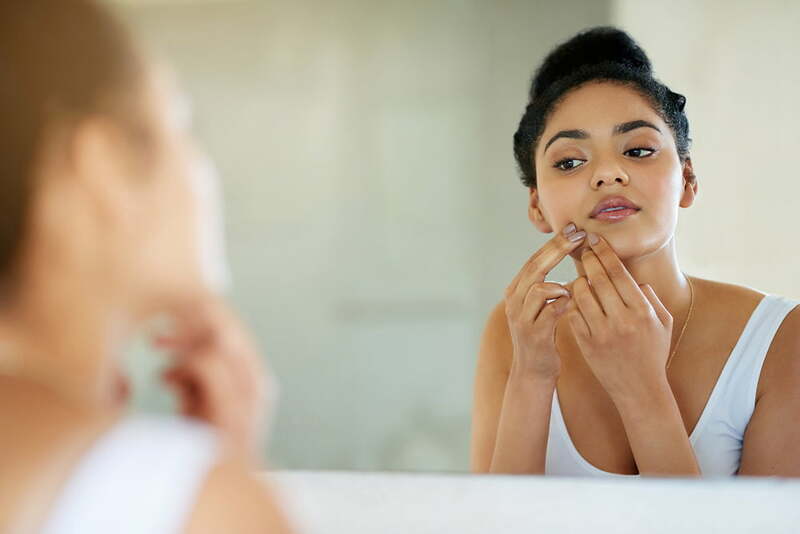 We recently asked Vincent Klomps, our resident Dermatology Physician’s Assistant, just why popping pimples is such a no-no. When a pore or hair follicle becomes engorged with excess sebum, dead skin cells, and bacteria, the pore becomes inflamed, swells, and pus is pushed to the surface of the skin. Essentially, your skin is already under duress by the time you notice a bump—and picking will only exacerbate the issue. Want more pimples? Popping yours will help. Before you interfere with it, your pimple is fairly self-contained—all the dead skin cells and bacteria are enclosed within a sac-like pustule under the surface of your skin. When you squeeze or prod, you risk rupturing the follicle wall and pushing all of that bacteria and debris deeper into the dermis, where further inflammation can occur. What’s more, you’re also introducing all the germs and bacteria that are living on your hands to an already vulnerable pore. What was once a single, fairly superficial pimple may then turn into a bigger breakout—or worse, transform into a more serious blemish, like a nodule or painful cyst that requires medical treatment. You may even scar yourself. Essentially, a successful pop may feel like winning the battle, but you’re losing the war. Every poke, squeeze, or scrape creates unnecessary damage to the skin. Your nails can puncture, the pressure of squeezing can cause bruising and swelling, and the act of popping is physically tearing your skin and leaving you with an open wound. It may not seem so traumatic on the surface, but remember: you are forcibly squeezing all that gunk until it literally rips through your skin—and the result isn’t great. Instead of just an unsightly bump, you may end up with post-inflammatory hyperpigmentation (discoloration on your face), a weeping wound, or noticeable swelling around the blemish. Did you know that pimples are your body’s healing response to blocked hair follicles? When you pop a pimple, you are not only harming your appearance and risking scars—you’re also interrupting the healing process you so desperately want to happen. That trauma we discussed above? It can lead to acne scarring and post-inflammatory hyperpigmentation (skin discoloration), which can be notoriously difficult to treat. This is particularly true of cystic acne, which occurs deeper in the skin and can affect large areas. Ice pick scars: deep, narrow scars that reach into the dermis, typically caused by deeper infections (like a cyst) that works their way to the surface. Boxcar scars: round depressions with steep sides, giving the the skin a pitted appearance. Rolling scars: abnormally shaped, ill-defined depressions that appear in wave-like patterns across the skin. Keloid scars: raised scars that are firm and often larger than the original wound. Acne scars can often be treated through specialty facial treatments, laser skin resurfacing, or even precisely injected dermal fillers, but there is no guarantee they will be able to be removed entirely. In most cases, simply leaving the pimple alone and allowing your body to do its thing is the best course of action. That being said, if the blemish is causing you pain or you’re dreading the idea of caking makeup over it for an upcoming event, there are a few things you can try. Dry it out. Spot treatments are available with low percentages of salicylic acid to draw out the oils, which can help shorten the life of the pimple. Overnight, hydrocolloid bandages or pimple patches can help support healing as well as provide a barrier to your picking. Calm inflammation. Wrap an ice cube in a soft cloth and apply to the pimple for 30 seconds or less with a few minutes of rest between, multiple times throughout the day. This can help reduce swelling and calm redness. It won’t help you heal faster, but it can alleviate pain and keep your pimple from looking angry. Call in the pros. For more severe breakouts, deep cysts, or cystic acne that just won’t budge, chances are you won’t get very far on your own. Schedule an appointment with your dermatology provider who can make expert treatment recommendations that may include a combination of prescription medication and in-office treatment. Our in-house acne solution is a gentle, effective treatment that doesn’t have some of the most common risks and side-effects as other medications, such as local irritation, psychological impact, or negative effect on pregnant women. In fact, it received the highest safety classification (“harmless”) from the results of its Toxic-Six-Pack test. Based on clinical results, our acne solution provides dramatic improvement in just weeks when coupled with in-office extraction services. It works by killing over 99.9% of P. Acnes, the bacteria responsible for most breakouts. Just to reiterate, we strongly recommend against popping your own pimples. However, we understand that sometimes you just can’t resist. While it’s still probably not a great idea, following a few simple rules can help decrease your risk of further infection or scarring. Picking at a blackhead or two probably isn’t going to cause huge issues, but you should still take precautions to avoid exacerbating the problem. First, make sure your hands and any items you’re using have been sanitized. Don’t use your fingernails or any other hard objects to force the blemish to drain, particularly if it hasn’t come to a head. The safest way to pop at home is using two clean Q-tips to pull away from the pimple while applying gentle vertical pressure around the sides, not squeezing. Applying a warm compress before attempting to pop a pimple can also help trigger drainage by softening the skin and loosening the pore. If nothing is happening, stop! It can be easy to go too far and be too forceful. Once you’ve got your fill of pimple popping videos, contact us! Drs. Reedy and Lindsay, Mr. Klomps, and our talented aesthetician can help you get your breakouts under control with clinically proven medications and products, smooth blemishes with state-of-the-art treatments, and reduce the appearance of acne scarring.